Since 1999 Anil Arora has been the President and CEO of Envestnet | Yodlee, and became the Vice Chairman of Envestnet in 2015. Behind Anil's leadership, Yodlee went public in 2014 and was successfully acquired by Envestnet in 2015. Through the years, Anil has helped grow Envestnet | Yodlee to over 1,300 employees. Throughout the past year and a half, Anil has fostered a close relationship between Yodlee and its parent company, Envestnet. By collaborating with leading financial institutions, entrepreneurs, and fintech developers, Envestnet | Yodlee has become a disruptive catalyst for creativity and ingenuity for millions of consumers and small businesses all over the world. Today, Anil is helping Envestnet and Yodlee lead the charge in driving the global consumerization of financial data to create a more financially informed generation, and ultimately a stronger global economy. 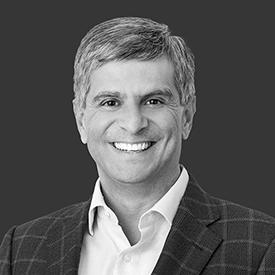 With 32 years in the workforce, Anil has innovated new market strategies and increased the lifetime customer value for some of the world's most recognized brands such as General Mills, Kraft, and Gateway. In addition, he holds a Master of Business Administration from the University of Michigan, and a Bachelor of Science from Rockford College.